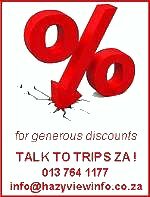 Trips SA is a Central Reservation Office, offering a free booking service. The Lodges, Hotels and Country Retreats in Hazyview cater for your every desire, whim and budget. From comfortable, affordable lodging to opulent, pampering luxury accommodation. Seeking Solitude, Peace and Quiet ? 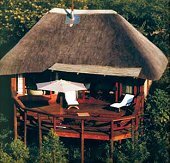 Situated within the 500 hectare Illanga Nature and Game Reserve. 54 Rooms include Casa's, Villa's, Twin and Double Suites and one "Casa Grande". The Casa's lead out to the gardens, the Villa's have private gardens or terraces, the Suites each have entrance halls, spacious sitting rooms, bathrooms with separate showers and toilets plus private patios which overlook the valley. The Casa Grande has a large sitting room opening onto a porticoed patio with a Jacuzzi, Sauna and private pool in an enclosed garden. On the upper level is a double bedroom with his and her bathrooms. Nestled amongst lush indigenous gardens on the banks of the Sabie River in Hazyview. Two large central swimming pools. Retreat in comfort to one of the 37 thatched semi self-catering chalets or 54 hotel rooms, which either overlook the picturesque gardens with its two swimming pools or the mighty Sabie River. Well stocked curio shop and lounge with Internet facilities. State-of-the-art Conference facility and Wedding packages also available. A Christian resort nestled on the ridge of Legogote Mountain, 24km from Hazyview. The double en-suite bedrooms contain two very comfortable beds and two desk/dressing tables with good lights and two chairs. There is ample cupboard space, and tea/coffee facilities. A continental breakfast is served in the dining room or on the verandah, or you may opt for the luxury of a breakfast basket in your room. All the bedrooms are non-smoking rooms. Conference facilities also available. Rissington Inn is an award-winning, affordable country lodge in the heart of the Lowveld. The 19 individual rooms and suites are surrounded by 10 acres (4 hectares) of extensive colourful gardens and offer comfortable, spacious and airy accommodation.